Is There Room on the Caps Bandwagon? To call myself a casual hockey fan would have been an insult to casual hockey fans. My hockey experience is a bit limited. In high school, my buddy Scott Krystinak and I took a day off from classes for a Caps high school media day. This was 1988. We drove out the Capital Centre, caught the tail end of practice, and then got to do some interviews. My highlight was asking Ed Kastelic whether he thought “goon hockey” was a problem for the sport. I’ll pause for you puckheads to stop giggling. For the more casual fan, Kastelic played in 228 NHL games (including playoffs), during which time he compiled 12 goals, 10 assists, and 751 penalty minutes. 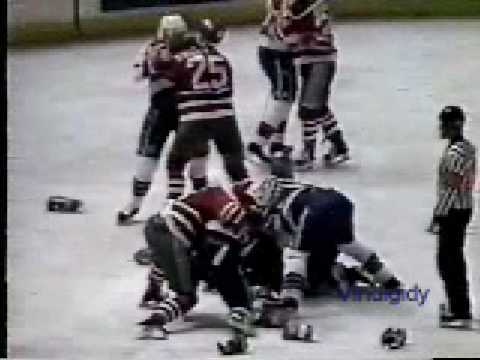 Google his name and you’ll find his profile athockeyfights.com, as well as grainy videos of him pummeling opponents. Thankfully, his response didn’t involve a left hook.